After the introduction last week of my passion on mental health issues I was tempted to dive into specific conditions. However, this week let’s focus on the causes of mental health issues and attempt to demystify this “Pandora’s Box” since we are surrounded by old and stubborn belief systems anchored by ignorance on what and why people become mentally ill. It is generally agreed that mental illness is caused by an interaction of multiple factors, which are namely: Biological, Psychological and Environmental factors. Biological causes of mental illnesses have been linked to abnormal functioning of nerve cell circuits or pathways that connect particular brain regions. These particular brain regions have specialised function. Nerve cells within these brain circuits communicate through chemicals called neurotransmitters. Excessive or a decline of these communicating chemicals in certain areas of the brain have been linked to and forms the basis of mental conditions. Most have heard these words to describe this complex interaction as chemical imbalance in very simple terms. Genetics (heredity): Mental illnesses can sometimes run in families, suggesting that people who have a family member with a mental illness may be somewhat more likely to develop one themselves. Susceptibility it is passed on in families through genes. Experts believe many mental illnesses are linked to abnormalities in many genes rather than just one or a few and how these genes interact with the environment is unique for every person (even identical twins). That is why a person inherits a susceptibility to a mental illness and doesn’t necessarily develop the illness. 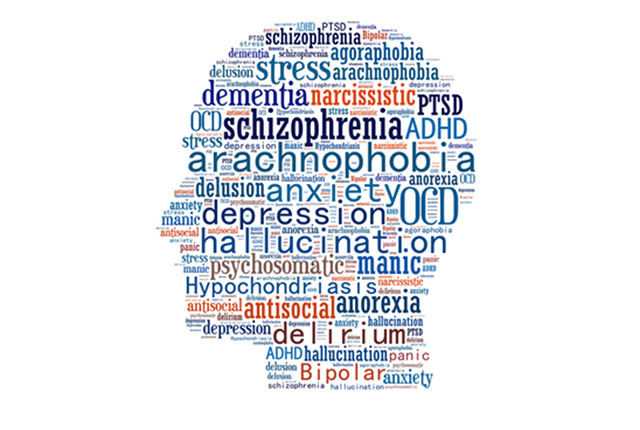 Mental illness itself occurs from the interaction of multiple genes and other factors such as stress, abuse, or a traumatic event, which can influence, or trigger, an illness in a person who has an inherited susceptibility to it. Infections: Certain infections have been linked to brain damage and the development of mental illness or the worsening of its symptoms. For example, a condition known as paediatric autoimmune neuropsychiatric disorder (PANDA) associated with the Streptococcus bacteria has been linked to the development of obsessive-compulsive disorder and other mental illnesses in children. Brain defects or injury: Defects in or injury to certain areas of the brain as a result of say road traffic accidents, concussion have also been linked to the likelihood of some mental illnesses. Prenatal damage: Some evidence suggests that a disruption of early fetal brain development or trauma that occurs at the time of birth for example, loss of oxygen to the brain, may be a factor in the development of certain conditions, such as autism spectrum disorder, epilepsy and schizophrenia. Substance abuse: Long-term substance abuse, in particular, has been linked to anxiety, depression, and psychosis. This has become a huge problem among the youths with the use of cough mixtures like Brocho (street name), heavy use of high grade cannabis, cocaine and elicit high concentrated alcohols. Social or cultural expectations. For example, a society that associates beauty with thinness can be a factor in the development of eating disorders. This is just a summary of causes of mental health illness and not an exhaustive list. I will hasten to say that these causes are recognised in all cultures and races not limited to African (CHIBHOYI) in the common Shona vernacular tone. It is my sincere belief that this background information explains why mental health occurs and that most of the conditions now have treatment protocols that is aimed to help such individuals. Next week we look at Depression the commonest mental condition.